1. Mix mushrooms, shallots, grated rind and lime juice together. 2. Use to stuff the fish. (Keep remainder for side salad). 3. Put the fish in barbecue wire baskets or wrap in lightly oiled foil. 4. Cook on the barbecue, or under a pre-heated grill, for 10-15 minutes on each side. 5. 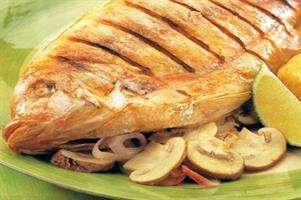 Serve with wedges of lime and salad leaves mixed with remaining mushrooms.